Posted on November 20, 2006 by Alicia Bay Laurel	in Blog. 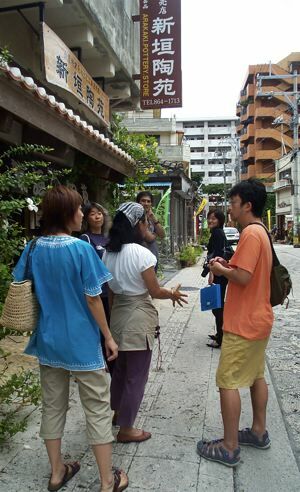 Yoko and Tetsuya Nema took us (me, Koki and Hiromi) on a walking tour of Naha City’s pottery district, which lies adjacent to the Peace Street Market. We were joined by Tetsuya’s cousin, Keiko, who works in a ceramics studio, and her friend, a photographer. 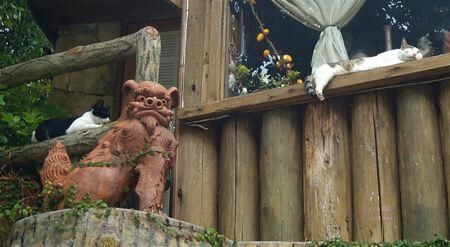 Nearly every Okinawan house has a pair of shisa figurines attached to it as protectors against evil spirits. The shisa is neither dragon nor dog, but has the features of both. In each pair, one has an open mouth and one a closed mouth. Some shisa look intimidating, but many are comical, even cartoon-like. 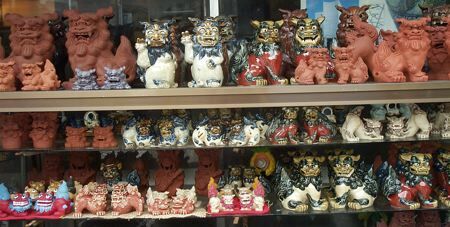 Since both residents and tourists buy shisa, the pottery district of Naha City fairly bulges with wide-eyed, toothy specimens. 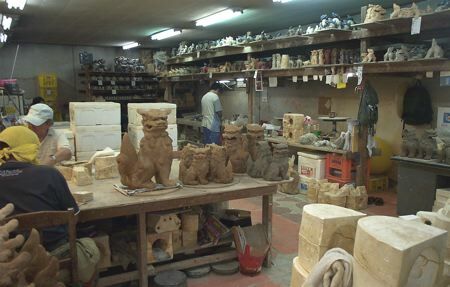 We visited a factory where shisa are formed in ceramic molds and the details carved by hand. We discovered that some residents of the pottery district are not the slightest bit intimidated by the shisa, and maybe even a little bored with them. 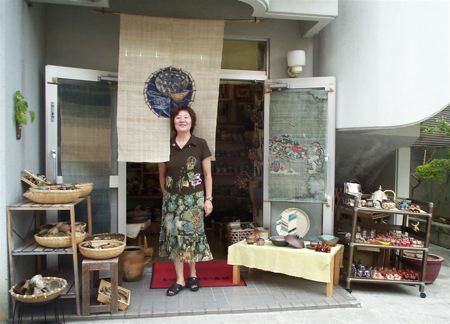 One of Yoko’s friends owns and runs this lovely shop without shisa, just elegant ceramics and textiles. I bought four unique placemats batiked with floral designs on natural indigo by a reknown Okinawan artist. I gave them to my mother, who likes them so much she has decided to frame them. 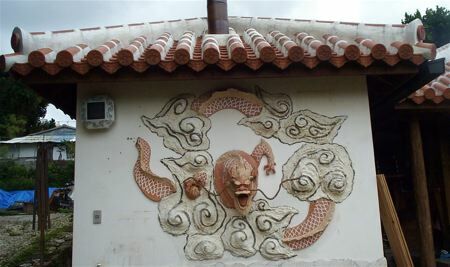 We stopped for tea at a pottery school with a ceramic dragon set into an exterior wall. 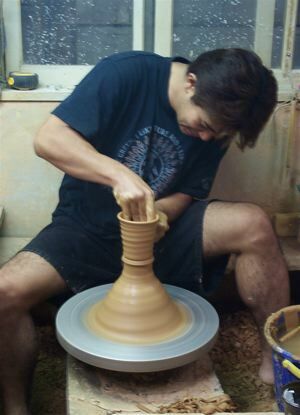 The teacher at the pottery school expertly turned out one perfect cup after another on the potter’s wheel. 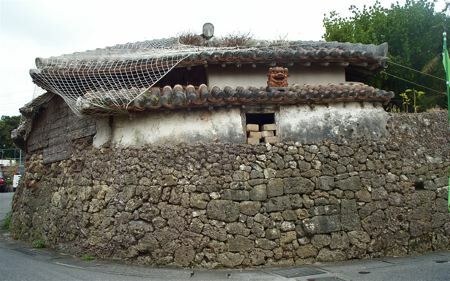 We walked past a very old traditional Okinawan house whose roof is secured with fishnet against the ravages of typhoons. The house is not liveable, nor can it be restored without destroying it, but it’s a historic site, so it is not disturbed. 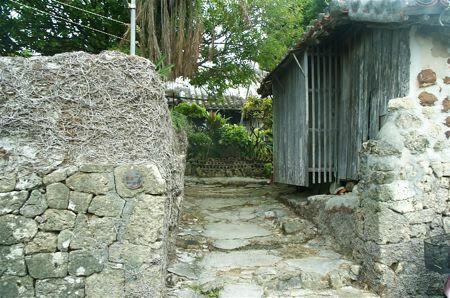 The street entrance to the compound of which the very old traditional Okinawan house is part. 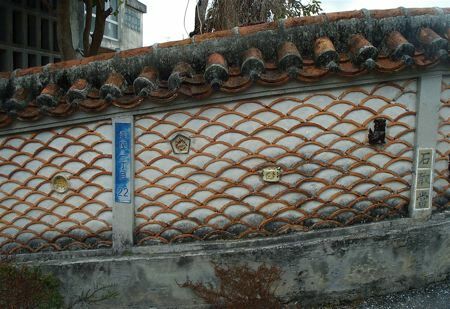 Across the road from the old house stands an intriguing curved wall, set with scale-shaped ceramic tiles, reminding me of the snakeskin sanshin and the sea snake remedies. 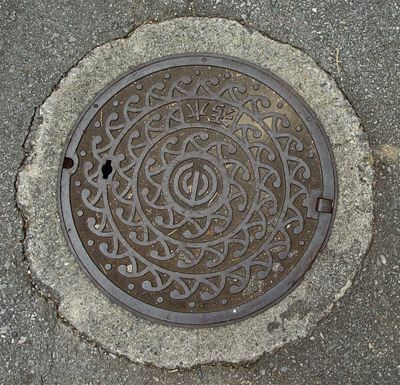 I almost got run over by a bicycle photographing the Naha City man hole cover design to add to my collection. Who said blogging is for couch potatoes?